This recipe for creamy oxtail soup is an addition to the recipe for clear oxtail soup. The recipe for the basic oxtail stock that is used in this recipe can also be found there. For 1 litre soup (4 to 5 portions); preparation 20 minutes. Melt the lard, suet or butter. Heat it until it starts to turn colour. This is a brown roux, the fat must be hotter than when preparing a white roux. This will be easier with lard or suet, because butter can burn. Add the flour in one go, and stir with a wooden spatula on medium heat until the roux has turned a light brown colour. Take care that the flour does not burn either and becomes too dark. Add the stock little by little and keep stirring until the liquid has been absorbed before adding more. If desired, a half cup of cream can also be added at this stage. Add the shredded meat to the soup and let it simmer for fifteen more minutes, whilst stirring at intervals. 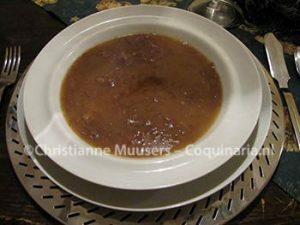 The Madeira is added to the individual soup plates just before serving.